Hunt writes that his experiment started when an attendee at a developer security conference where Hunt was presenting realized that his car, a Nissan Leaf, could be accessed via the internet using Nissan’s phone app. Using the same methods as the app itself, any other Nissan Leaf could be controlled as well, from pretty much anywhere. As you can see, Hunt was able to access the Leaf in the UK, which wasn’t even on, and gather extensive data from the car’s computer about recent trips, distances of those trips (recorded, oddly, in yards) power usage information, charge state, and so on. He was also able to access the HVAC system to turn on the heater or A/C, and to turn on the heated seats. It makes sense these functions would be the most readily available, because those are essentially the set of things possible via Nissan’s Leaf mobile app, which people use to heat up or cool their cars before they get to them, remotely check on the state of charge, and so on. If you look in that code, you can see that part of the request includes a tag for VIN, which is the Vehicle Identification Number (obfuscated here) of the car. Changing this VIN is really all you need to do to access any particular Leaf. Remember, VIN are visible through the windshield of every car, by law. This is pretty self-explanatory if you read through the response; we’re seeing the battery status of his LEAF. But what got Jan’s attention is not that he could get the vehicle’s present status, but rather that the request his phone had issued didn’t appear to contain any identity data about his authenticated session. In other words, he was accessing the API anonymously. It’s a GET request so there was nothing passed in the body nor was there anything like a bearer token in the request header. In fact, the only thing identifying his vehicle was the VIN which I’ve partially obfuscated in the URL above. So, there’s no real security here to prevent accessing data on a LEAF, nor any attempt to verify the identity on either end of the connection. Even if you don’t understand the code, here’s what all that means: we have the ability to get personal data and control functions of the car from pretty much anywhere with a web connection, as long as you know the target car’s VIN. While at the moment, you can only control some HVAC functions and get access to the car’s charge state and driving history, that’s actually more worrying than you may initially think. 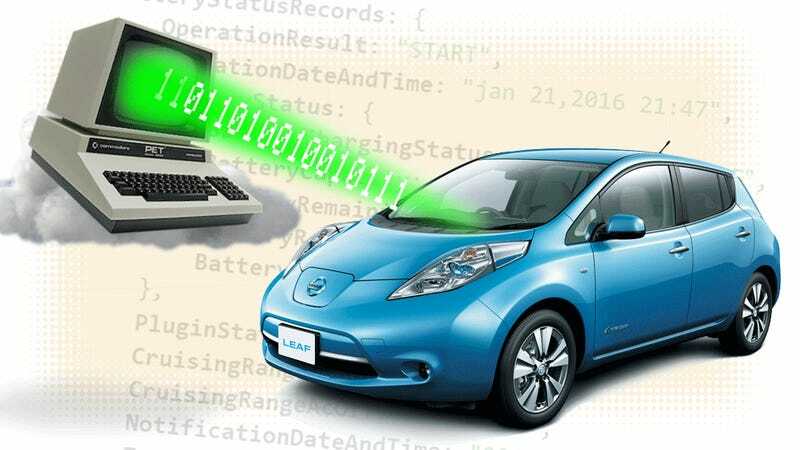 Not only is there the huge privacy issue of having your comings-and-goings logged and available, but if someone wanted to, they could crank the AC and drain the battery of a Leaf without too much trouble, stranding the owner somewhere. There’s no provision for remote starting or unlocking at this point, but the Leaf is a fully drive-by-wire vehicle. It’s no coincidence that every fully autonomous car I’ve been in that’s made by Nissan has been on the LEAF platform; all of its major controls can be accessed electronically. For example, the steering wheel can be controlled (and was controlled, as I saw when visiting Nissan’s test facility) by the motors used for power steering assist, and it’s throttle (well, for electrons)-by-wire, and so on. It’s great Nissan was “exemplary” but it would have been even better if they’d implemented at least some basic security before making their cars’ data and controls available over the internet. Security via obscurity just isn’t going to cut it anymore, as Troy Hunt has proven through his careful and methodical work. I’m not sure why carmakers don’t seem to be taking this sort of security seriously, but it’s time for them to step up. After all, doing so will save them from PR headaches like this, and the likely forthcoming stories your aunt will Facebook you about how the terrorists are going to make all the Leafs hunt us down like dogs. Until they have to recharge, at least.